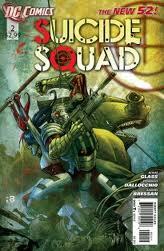 So, here we are at issue #2 of Suicide Squad and what did we learn from last month’s opening kickoff? A buncha nothing, that’s what. I was really looking forward to this title when it was first announced, mainly because I’m in need to find a quirky book filled with characters that don’t necessarily belong together – I’ll fan-up and admit I’m trying to plug the hole in my heart left when Secret Six got nixed – and this book showed promise. Issue #1 didn’t give me a whole lot to go on, but I liked it overall, even if I didn’t care for Harley’s freaky psycho-chic thing (Paul Dini’s Harley is the only Harley for me) and Deadshot’s signature southern drawl flip-flops between present to non-existent. I can overlook these things in favor of story. Speaking of which, issue #2 picks up where the first left off, with the Squad sent to exterminate an entire stadium of fans, fans that have turned from rabid football fanatics to virally infected rabid football fanatics. Deadshot is depicted as team leader, taking orders from a less mannish slimmed-down Amanda Waller who looks to have rebooted her booty in her downtime (Shake Weight? Maybe.) She calls the shots or else the whole team gets waxed thanks to cranially implanted bombs. And some do. No spoilers, although when it happens, it doesn’t necessarily make sense in the whole scheme of things. Plenty of gore-filled super-fights that eventually leave Deadshot an ultimatum: Make yourself scarce, Momma will be there to pick you up when she can. So there. The art bounces back and forth between series regular Dallocchio and Bressan’s pencils; Dallocchio gives the cast a creepy look that works and Bressan’s work doesn’t, which is distracting. One thing I will say: the darker hued coloring from Val Staples suits the book’s vibe to a tee. I’m hoping things open up a bit in the coming months and we learn a little more about why these characters were selected other than Waller’s do-as-I-say-or-I’ll-kill-you grandstanding. Still, not bad…but I can’t help feeling that the Squad can be better. Verdict: 3 out of 5 stars.